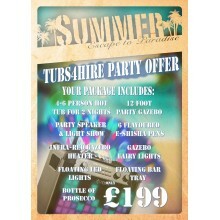 The most popular option, the 3 night package is a fantastic way to sample one of our great hot tubs. This package gives you 2 nights use of your hot tub with an additional night being included in your package to heat the tub up. 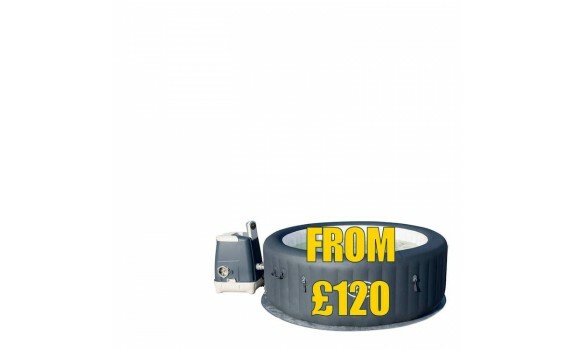 We will come to you and set up a fantastic hi-tec inflatable hot tub in your garden. Imagine the fun of a hot tub but without the hassle of cleaning and maintaining it, not to mention the hassle of storage and wear and tear. Within a few hours the tub can be filled with cold (or hot) water from your tap. ready for you to jump into and relax. 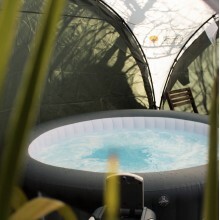 As it is inflatable, we can set it up in places where a solid tub cant fit so this is the ideal choice for everyone with the comfort and features found in much more expensive hot tubs. This price is for 3 nights, so when you make an online booking, choose the options you require above, add to the cart and then select a delivery date and time slot when you get to the delivery section of the checkout process. Monday deliveries are picked up on Thursday. Tuesday deliveries are picked up on Friday. Thursday deliveries are picked up on Sunday (Bank holidays have Tuesday pickups but please add the extra day option). Friday deliveries are picked up on Monday (Bank holidays have Tuesday pickups). A bit about the difference between the hot tubs..... There are 4 to choose from, the 2-4 person air bubble Miami, the 4-6 person Hawaii, which is a square air bubble model, the 4-6 person Palm Springs Hydrojet, which is a round water jet model, and the 6-8 person Monaco, which is a round tub with air bubbles. The air bubble models, have hundreds of bubbles originating from the bottom of the hot tub whilst the water jet models have 8 powerful jets coming out of the side walls. These are great for a massage effect. They are all around 2x2m and are all fabulous! A £75 RETURNABLE DEPOSIT WILL BE REQUIRED ON DELIVERY DAY. THIS WILL BE RETURNED AT THE END OF THE HIRE PERIOD IF NO DAMAGE IS INCURRED. THIS WILL NORMALLY BE REFUNDED BY PAYPAL. IMPORTANT: PLEASE NOTE THAT WE WILL NEED TO USE YOUR GARDEN HOSE TO FILL THE HOT TUB. IT WILL TAKE AROUND AN HOUR TO FILL IT TO THE POINT THAT WE CAN TURN IT ON. AFTER THAT POINT WE WILL LEAVE YOU TO FILL THE REST. WE WILL BRING ALL THE EQUIPMENT NEEDED TO DO THIS. THE HOT TUB WILL TAKE UP TO 36 HOURS TO REACH ITS MAXIMUM TEMPERATURE IN THE WINTER. Note: This package is only suitable for the 4-6 person Palm Springs Hydrojet hot tub. You'll see signs everywhere.....no children allowed in hot tubs. But under the correct parental supervision and strict control of temperatures and time of exposure it can be safe. We don't recommend this package for children younger than 12. Although great fun for kids, grown ups love this package too! The number one question asked about hot tubs is ...... can I use bubble bath? The answer is always "NO". It damages the hot tub and creates a cleaning nightmare. That's generally true, but with the right cleaning methods the risks of damage are minimised. This specially formulated bubble mixture transforms your hot tub into a bubble bath. It is not usually recommended to mix bubble bath with hot tubs but we have tested many bubble mixtures to come up with one that is kind to skin and quick to dissipate once the water jets are off. Because of the extra cleaning required after the hire period, we have to charge more than the sachet prices but you can't put a price on fun! Please note that surfaces can be extra slippery with foam so extra care must be taken. The bubbles will disappear within a couple of minutes once the water jets are stopped but they will come back once the jets are turned on again.It may be a good idea to add the sachets towards the end of the hire period as once they are added you will get lots of bubbles every time the water jets are turned on. 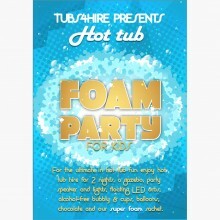 You will receive 3 sachets so that you decide whether you want a few bubbles, a very bubbly time, or a super foam party!! * Very important. It is essential that you do not use any other bubble bath or foaming liquid on the hot tub. Not only will this produce too many bubbles but other bubble bath mixtures will damage the hot tub. If it is found that you are using any other bubble liquids then you will be liable for the damage to the hot tub. Bubble liquids can be slippery and so it is recommended that there is parental supervision at all times. Ensure that the floor is wiped up immediately if there are any spills. Please see our terms and conditions to read about all the safety instructions for hot tubs. We recommend that you use the foaming sachet at the end of your hire period as once you put it in you will have foam for ever more. So save it until you are not likely to want to use the hot tub after. Note: The foam will take a few minutes to build up when the jets are switched on. They will disappear as soon as the jets are turned off, but turn them on again and they come back! Add all 3 sachets if you want super foam! A bit about the difference between the hot tubs..... There are 3 to choose from, the 4-6 person Hawaii, which is a square air bubble model, the 4-6 person Palm Springs Hydrojet, which is a round water jet model, and the 6-8 person Monaco, which is a round tub with air bubbles. The air bubble models, have hundreds of bubbles originating from the bottom of the hot tub whilst the water jet models have 8 powerful jets coming out of the side walls. These are great for a massage effect. They are all around 2x2m and are all fabulous! IMPORTANT: PLEASE NOTE THAT WE WILL NEED TO USE YOUR GARDEN HOSE TO FILL THE HOT TUB. IT WILL TAKE AROUND AN HOUR TO FILL IT TO THE POINT THAT WE CAN TURN IT ON. AFTER THAT POINT WE WILL LEAVE YOU TO FILL THE REST. WE WILL BRING ALL THE EQUIPMENT NEEDED TO DO THIS. THE HOT TUB WILL TAKE UP TO 20 HOURS TO REACH ITS MAXIMUM TEMPERATURE. We have bundled together some of the ingredients to make the perfect party and here it is, the party package! 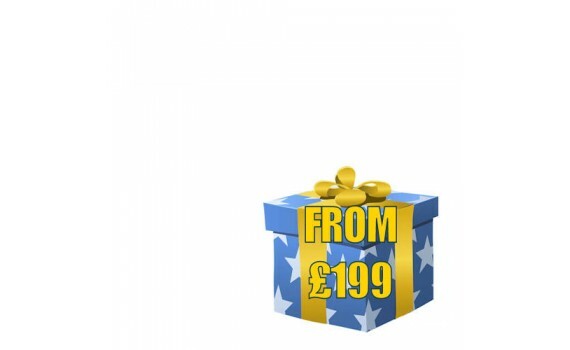 By choosing this ready made package you will save £55 on buying the add-ons separately. IMPORTANT: PLEASE NOTE THAT WE WILL NEED TO USE YOUR GARDEN HOSE TO FILL THE HOT TUB. IT WILL TAKE AROUND AN HOUR TO FILL IT TO THE POINT THAT WE CAN TURN IT ON. AFTER THAT POINT WE WILL LEAVE YOU TO FILL THE REST. WE WILL BRING ALL THE EQUIPMENT NEEDED TO DO THIS. THE HOT TUB WILL TAKE UP TO 36 HOURS TO REACH ITS MAXIMUM TEMPERATURE, ESPECIALLY IN THE WINTER. Before you use the hot tub for the first time, it is necessary to add some chemicals that will keep the tub clean and clear. This chemical is called Chlorine. Chlorine is essential to fight bacterial build up over the hire period. We will give you enough sachets of Chlorine to last for the entire hire period. We also supply each tub with a brand new filter so you can be assured that you wont be recirculating someone else's dirt. When we come to collect the tub at the end of the hire period, we will clean it before packing it away. Relaxation will start straight away with the simple booking process. With this in mind, we will deliver the equipment and set-up the hot tub a day before it is needed. It usually takes around a day to warm up so when you wake up the next day it should be ready to jump into. We will then collect it on the last day and take it back to our offices. All this is included in your hire package (up to 10 miles from our offices). Hot tubs are powered by electricity and as such, care needs to be taken. Our tubs have RCD cut-offs fitted as standard. If there are any electrical issues the unit willl shut itself down without any risk to you. Any supplied electrical items are either battery operated or located far away from the tub itself. All equipment supplied is PAT tested annually and all our hire services are all covered by our public liability insurance. We have many extras that you can purchase through the website that will make your hot tub hire even more special. These range from ambient lighting to inflatable drinks trays. Just go to the add-ons category, have a look and add some to your shopping cart. Our add-ons are split into two categories, add-ons to buy and add-ons to hire. All hire prices are for the duration of the booking regardless how long.